Nobody believes how easy this soup is once they taste the depth of flavour. The carrots and apples are roasted together with fresh rosemary, olive oil and whole garlic cloves, letting everything infuse and because the apples cook quicker they start to caramelise, taking the flavour even further. That’s not even the best part, the fried rosemary and pistachio topping is crazy delicious – you’ll want to add it to everything! Peel your carrots and apples. Cut the carrots lengthways and then cut the halves in half. Chop the apples into wedges. Add the carrots and apples to a large roasting tray with the two cloves of garlic (in their skins). Drizzle on the olive oil and scatter the rosemary leaves on top. Sprinkle with a good pinch of coarse salt and pepper and toss everything well, spreading it out across the roasting tray. Roast at 200’C for about 35 minutes until the apples are mushy and the carrots are soft. 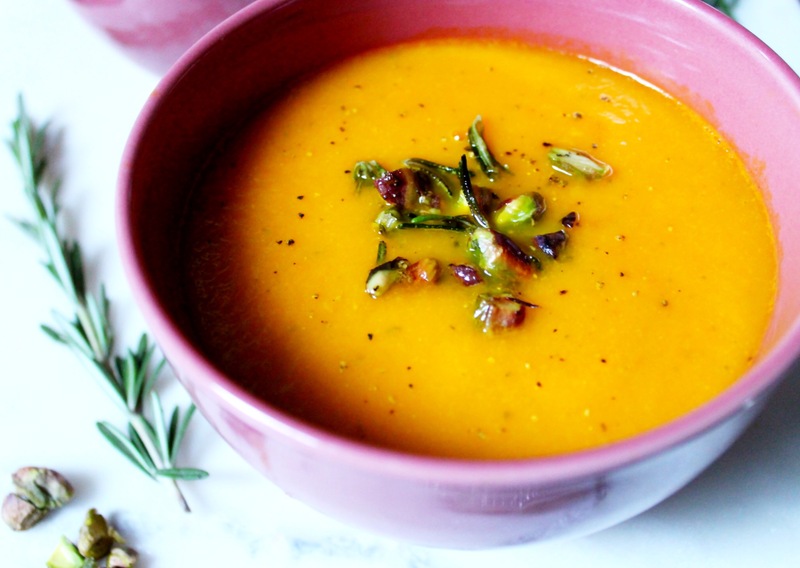 Add the stock to your blender with the roast carrot and apples. Squeeze the garlic out of it’s skin and add it in too. You may have to do this on batches depending on the size of your blender. Blend on high until smooth. Pour the smooth soup into a large pot on medium heat and cook until heated through. While the soup is heating, make the topping. Roughly chop the pistachios. Add the olive oil to the centre of a small pan on medium heat, then add the pistachios, rosemary leaves and a good pinch of coarse salt into the oil. Let it all sizzle and fry for a few minutes, tossing regularly until the rosemary is nice and crisp. 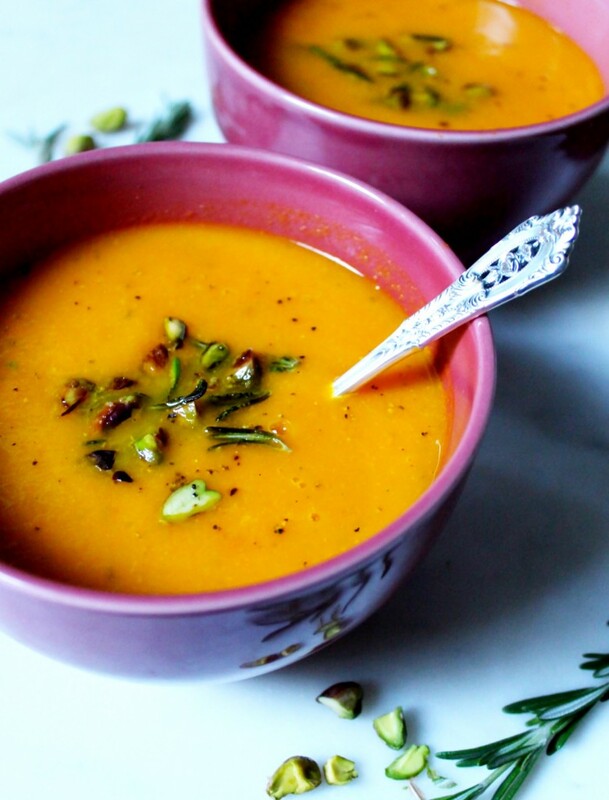 Serve the soup with a generous sprinkle of topping. I’m loving this soup! It’s so tasty and hearty and the rosemary gives it something special. Enjoyed this soup a lot! The crispy herbs and nuts make it very interesting too! Thanks for the recipe!